Alongside Dr. Merheb’s academic responsibilities, he is a fellow of The American Academy of Cosmetic Surgery and a fellow of… the American College of Surgeons (FACS), both extremely prestigious organizations. He also consistently serves many community organizations.In his new state-of-the-art facility, Dr. Merheb combines the art and science of Cosmetic and Maxillofacial Surgery to provide his patients with complete facial analysis and recommendations for treatments that will achieve both a functional and aesthetically pleasing outcome. 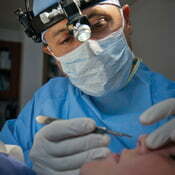 In addition, his dental background allows him to work closely with dentists for a complete makeover of the face. He routinely and safely performs both surgical and non-invasive procedures in a private setting.